So the time has come and you are ready to put your house on the market. You have already taken the necessary steps with your real estate agent, but now you need to make your home aesthetically pleasing to potential buyers. Let us help with our list of a few helpful tips to get your home ready for people to see… ready to buy! Now you may have lived here for a long time and you don’t notice that the paint has dulled, or that there is film buildup on the walls. But a potential buyer will be looking at those things as things they do not want to have to do when they move in. If the walls are clean, or freshly painted this will ease the buyers mind on one less thing they will have to do when they move in. Trim the bushes, plant more flowers and mow the lawn! You want your home to be just as pleasing from the outside as it is from the inside. You can even stage areas in the yard for lounging to entice people to imagine their summer BBQs or family gatherings being held there. Powerwashing the concrete always helps with that finishing touch as well! You know that cracked lightswitch, chip in the paint or ripped screen that has been bugging you for months? Well it will likely catch the potential buyer’s eye as well. Take a day or two, run out to your local hardware store and make those minor repairs that may deter a potential buyer. Or call a professional to help you accomplish tasks like re-screening. Yes we know the 80 gnomes in your living room are your favorite things in the whole world, but for the purpose of selling your home, they need to go! Clear out any areas that have random stuff that has accumulated that you may not even notice anymore! Move any extra furniture that is crowding a room neatly into the garage. Make the space look open and uncluttered. So you have cleaned the house from top to bottom, decluttered and cleaned the yard, but as you go to look out the window the film on your windows is putting a haze on your view. And the dingy look from the outside is making it look like you need all new windows. Make sure your windows are sparkling so that not only can the visitors see out to the amazing yard or scenic view, but that also when they are outside looking in it doesn’t look like the fog has rolled in on the inside of your home. 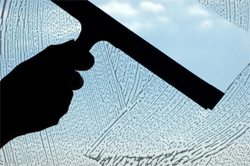 Take the worry out of getting this task accomplished on your own and hire a professional to help your windows sparkle! Good luck selling your home, and if you need help with your window cleaning, screen repair or power washing in Orange County, please feel free to contact us! We clean blinds too!